This will be our fourth year visiting all of the YMCA Afterschool sites in our school district to read books and do a short craft with them, and our visits started in September. (Although the kids go back to school in August, we generally take August off from programming and we like to give the sites a chance to get into their routines before we start visiting.) You can read more about our Afterschool outreach on the ALSC Blog here and here. Last school year, I posted monthly about what books I was taking on my visits, so check out the afterschool tag for those posts. Five of my six staff members (including myself) split up visits to the nine Afterschool sites each month. A few of the sites have very large groups (40-50+ students) and I send two people on those visits. I see two of the sites and my two groups are very different. Site A is located in the city and this year it's a very young group - lots of new Kindergarteners - which I'm hoping will make it a little bit easier this year. (Last year, this site had lots of older kids who were too-cool-for-school, so I had to be very strategic in what I brought.) Site B is located in one of our most affluent suburbs and they love books and will sit through anything that I bring. It is not unusual for me to read four or five books to this group and I'll often bring longer books knowing that they can handle it. Sometimes I'll bring the same books to each site and sometimes I'll have some overlap and then sometimes I'll read completely different things. It all just depends on how the visits go. 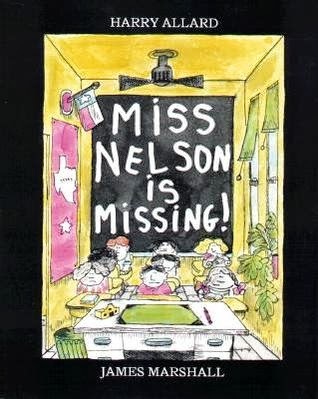 Miss Nelson is Missing by Harry Allard, illustrated by James Marshall. Houghton Mifflin, 1977. I always start the year with this one because it's one of my favorites and a perennial favorite of the kids. The kids who have heard it before know the surprise ending and delight in keeping the secret (or blurting it out... either way). The canvas bag we bring to each visit has Viola Swamp's picture on it, so it's a great way to introduce our program to new faces and connect all our visits. 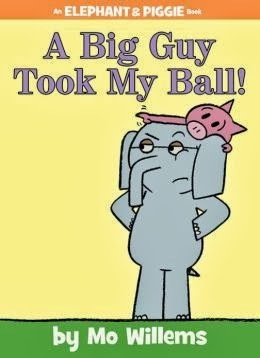 A Big Guy Took My Ball by Mo Willems. Disney-Hyperion, 2013. Add this to the growing list of Elephant and Piggie books that make GREAT readalouds. My kids at Site B are especially huge fans of Elephant and Piggie and they were so happy that I had brought a new one to share. If you do voices, make sure to practice your HUGE WHALE voice. 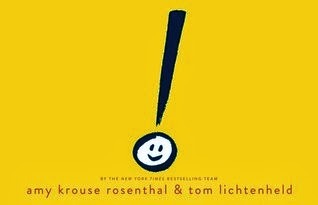 Exclamation Mark by Amy Krouse Rosenthal and Tom Lichtenheld. Scholastic Press, 2013. I wasn't sure how this one would go over and if the kids would get it, so I skipped it with Site A (so many Kindergarteners! ), but the kids at Site B really liked it. Voice inflection is really important with this one to tell the dialog apart. This would also make a GREAT book to share with kids working on punctuation or possibly English language learners to demonstrate the different voice sounds when asking a question or making an exclamation. 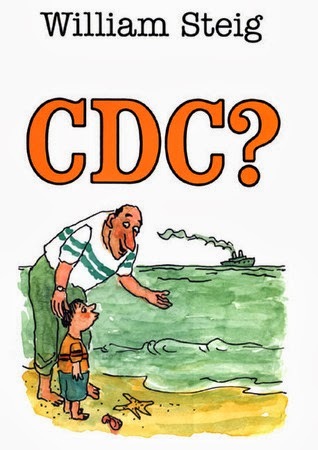 CDC by William Steig. Farrar, Strauss & Giroux, 1984. Okay, so I brought this one to Site A anticipating all those older, punky kids. When I was faced with a group of mostly-Kindergarteners, I wasn't sure how it would go and I would have skipped it, but they asked me for a third book (saying, "You always bring three books, Miss Abby! "), so I tried it. And for the most part it went way over their heads. I had one little girl who got the idea and would chime in with the answers, but it just didn't work with the group I had. The idea is that each spread is a phrase that's written out in letters or numbers that sound like words or parts of words. You read the letters/numbers and the kids try to decipher what the message is (with help from an illustration). The cover image "CDC?" translates to "See the sea? ", etc. It's a fun book and great for older kids who like word games, but it just didn't go for my Afterschool crowd. Lesson learned! We only tried a few of the spreads and then I decided it was time to move on to our craft. This month's craft was complete-the-picture, inspired by 25 Days of Art: Complete the Picture from In the Children's Room. We cut cardstock into half-sheets and used leftover magazine cutouts from when we did I Spy Collages last year. We had a volunteer glue a small picture on to each cardstock piece and the kids could select a picture to add a background or complete their picture. The kids enjoyed it and some of them were really creative with it! What are your favorite real-alouds for the K-4th set?